This time three weeks ago, I was in the Bekka valley on the border between Syria and Jordan witnessing at first hand the inhumane conditions in which children and their families are forced to live. Across the region, 14 million children are in need of humanitarian support, making this the single biggest humanitarian crisis since World War Two. It’s hard to grasp the scale of this crisis. The total number of Syrian children in need of assistance is 15 times what it was in 2012. Almost 2 million Syrian children have fled their homes and are living as refugees most of them in Lebanon, Turkey and Jordan. In Lebanon alone, more than 1.2 million refugees (600,000 of them children) have crossed the border. Many are living in 1,600 informal camps, lacking basic water and sanitation facilities. More than 8,000 children have been separated from their families and crossed the border alone. It breaks my heart to think of a child, on their own, wandering across a national border without any protection or support. Thankfully, UNICEF is there to care for them. The statistics, though devastating, don’t tell the full story. Back home in Cork, it’s the children’s stories that I can’t get out of my head. I met families who’ve experienced unimaginable horror, forced to flee with nothing but the clothes on their backs. I met children who have seen things no child should ever see. For the youngest children, this crisis is all they have ever known. Over 100,000 babies have been born as refugees, living in tents and exposed to the harsh winter weather. On my first morning in the refugee camp, I meet 21-day-old baby Amira in a mobile medical tent run by UNCIEF. One day each month, Dr Ali Hayek sees up to 120 children providing vaccinations, nutritional support and basic medical care. 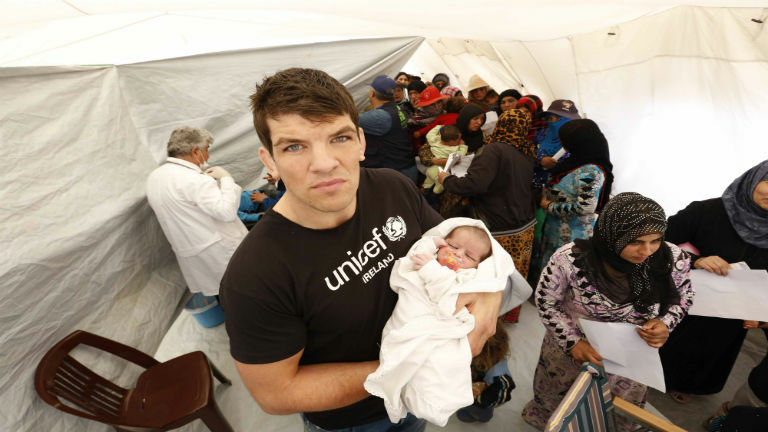 Thanks to the generosity of the Irish people, UNICEF has funded 21 mobile medical units, providing free primary healthcare to refugees. Many are still feeling the effects of a devastating winter. Just weeks ago, the Bekka Valley was blanketed in snow. The winters are harsh here, with freezing winds and frigid below zero temperatures. Families sleep in tents with no insulation, as the temperature drops well below zero each night. UNICEF has provided warm winter clothing, boots, blankets and other winter supplies to almost one million children both inside Syria and those who’ve fled and are living in refugees in neighbouring countries. Despite the upheaval caused by the conflict, children continue to demonstrate incredible courage and determination. I visited a non-formal education centre where 350 children have the opportunity to learn and be with their new friends in a safe space. I wandered into one impromptu classroom, a drafty tent with children’s drawings stuck to the tarpaulin walls. The children were singing and shrieking with joy, playing blind man’s buff. The teacher took one look at me, saw my UNCIEF t-shirt and welcomed me in. Within minutes the hot pink blind fold was over my eyes and I lumbered my 6’6” frame around the tent playing with the children. I was reminded, yet again, how remarkably resilient children are. Working with UNICEF, I can’t help but think of my own children. Like every parent, I would do anything for my kids. I only want what’s best for them. When my daughter comes home from pre-school chattering about the planets or whatever it is she’s been learning about that day, I can’t help but think of the children I’ve met (some as old as 7) who’ve never been to school. Across the region, 2.6 million children are out of school. When Syria’s bitter war comes to an end, this generation of children will need to rebuild a broken nation. UNICEF is committed to providing these children with the skills they’ll need to provide a more stable future for the region. As the Syrian conflict enters its fifth year, families are becoming more desperate than ever. Whatever savings they may have had are gone and their hope for the future is dwindling by the day. Children are vulnerable to forced marriage, child labour and gender based violence. Eighteen months ago, I visited these camps. In that time, some improvements have been made but the situation remains critical. The sheer scale of UNICEF’s humanitarian response, and the amount of money required each day to finance it, is breathtaking. Across the region, 14 million children are in need of humanitarian assistance. That’s three and a half times the population of Ireland. Irish people are very generous. As a nation, we’ve been through hard times ourselves. 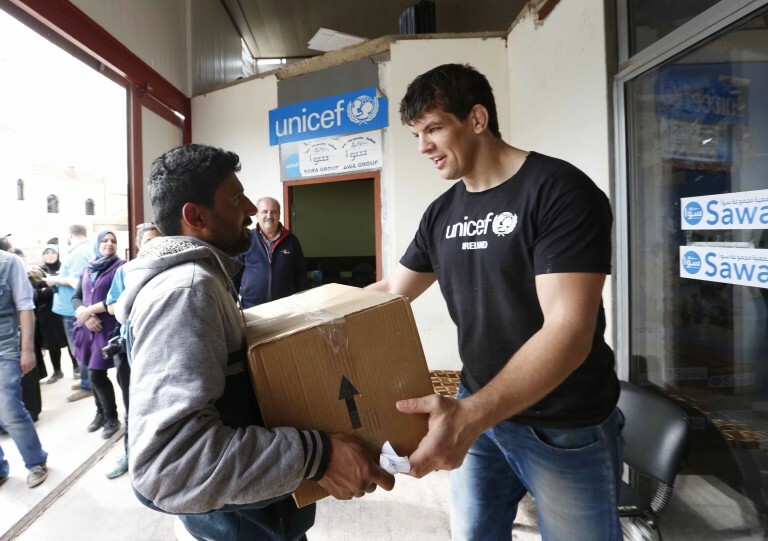 Thanks to that generosity, UNICEF are on the ground delivering clean water, sanitation, education, medical care, immunisation services and psychosocial care to millions of children and their families. We need your support to continue this vital work. Some 53% of Syrian refugees are children who, with each day of war, watch their futures slip away, their lives defined by fear, violence and suffering. We must not forget them. UNICEF is working to ensure that the rights and wellbeing of every single child are protected. With your help, we can ensure that no child gets left behind.